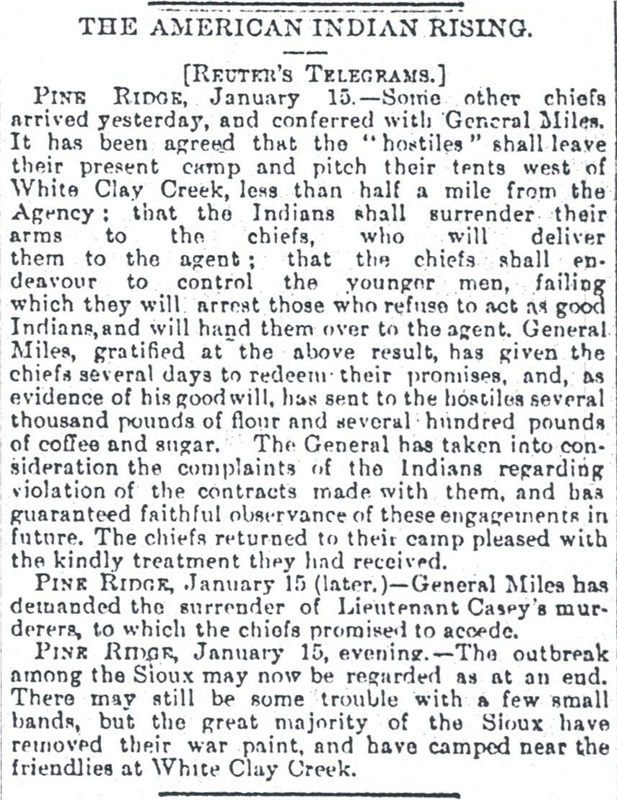 PINE RIDGE, January 15.—Some other chiefs arrived yesterday, and conferred with General Miles. It has been agreed that the "hostiles" shall leave their present camp and pitch their tents west of White Clay Creek, less than half a mile from the Agency; that the Indians shall surrender their arms to the chiefs, who will deliver them to the agent; that the chiefs shall endeavour to control the younger men, failing which they will arrest those who refuse to act as good Indians, and will hand them over to the agent. General Miles, gratified at the above result, has given the chiefs several days to redeem their promises, and, as evidence of his good will, has sent to the hostiles several thousand pounds of flour and several hundred pounds of coffee and sugar. The General has taken into consideration the complaints of the Indians regarding violation of the contracts made with them, and has guaranteed faithful observance of these engagements in future. The chiefs returned to their camp pleased with the kindly treatment they had received. PINE RIDGE, January 15 (later. 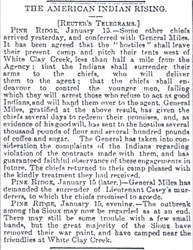 )—General Miles has demanded the surrender of Lieutenant Casey's murderers, to which the chiefs promised to accede. PINE RIDGE, January 15, evening.—The outbreak among the Sioux may now be regarded as at an end. There may still be some trouble with a few small bands, but the great majority of the Sioux have removed their war paint, and have camped near the friendlies at White Clay Creek.